Halfway between Cape Town and Knysna, there is a republic of villages and towns – Swellendam, Suurbraak, Barrydale, Buffeljachts, Stormsvlei, Malagas and Cape Infanta. Motorists passing through only slow down to avoid the malevolent constable and his radar perched behind a cluster of Blue Gums on the N2. 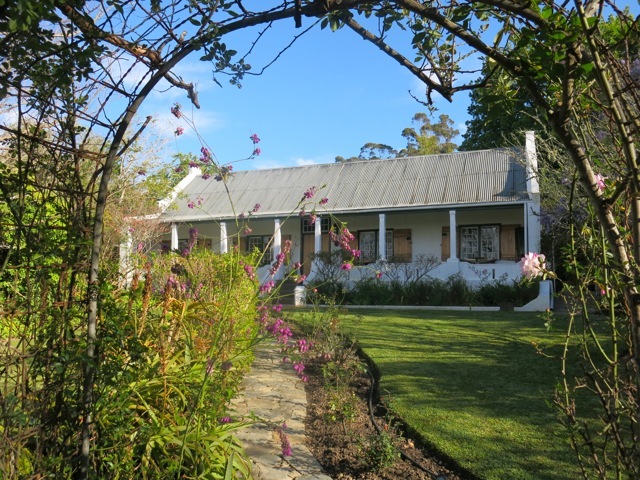 But Swellendam is worth exploring – carrying a heavy historical burden of Dutch rule and Calvinist architecture, it looks conservative. Scratch a little deeper and you’ll find a lively community of artists and creatives who simultaneously subvert and celebrate tradition and culture. You’ll find a leading ceramic artist, a chocolate master, a manufacturer of exportable bath products, a Rasta and gourmet restauranteur, all within spitting distance of the Drosty Museum. 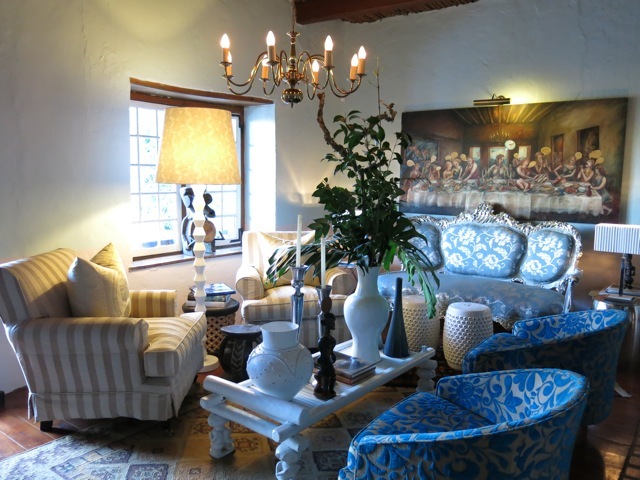 In the heart of the village, lies Augusta de Mist – an 1802 Cape Dutch homestead and guesthouse, whose eclectic modern decor juxtaposed against collectible art and antiques, epitomises the paradoxical nature of the place. The interiors are vibrant and artistic, reflecting the personalities of the owners and referencing contemporary African style. Staying there is lesson in luxury – Owners Henk and Michel laid on coffee and fresh baked cake as I arrived and their generous hospitality didn’t stop. 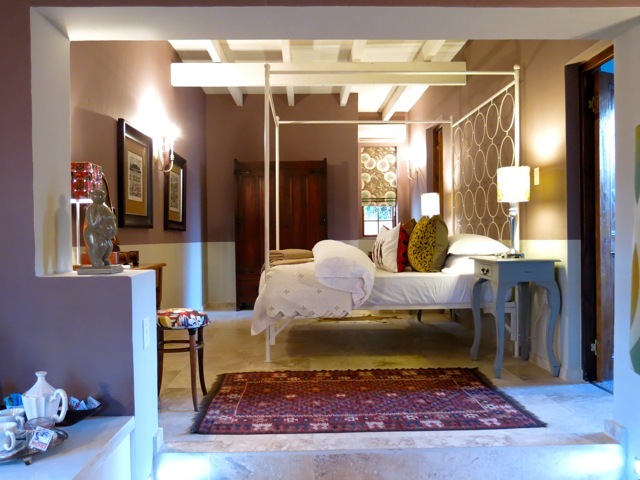 The bedrooms are decorated with a wonderful quirky style and attention to detail includes everything from quality linen to rusks, books and an excellent selection of music and arthouse DVDs. It’s so comfortable you might not want to leave your room, but venture into the garden which is huge and rambling. You’ll find secret corners, indigenous plants and birds and a private pool area that will soon have you reclining with a martini. Henk doesn’t cook every night, so you may have to eat in the village at one of the local restaurants – I recommend de Companjie or FIeld and Fork. If Henk cooks you are in for a treat! 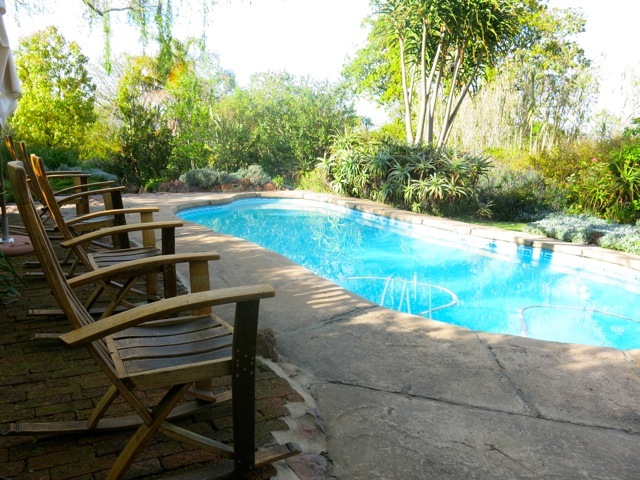 Swellendam is a great stopover, but slow down on your next trip and stay a couple of nights. If you are energetic use it as a base to explore all the local reserves, watch whales at Cape Agulhas, or hike and bike in the Marlmoth and Bontebok reserves.